New Zealand's leading literacy programme now available online! The world’s leading suite of assessment software programmes. Extensively researched, suitable for school use. Identify learners with dyslexia, cognitive deficits and other difficulties. 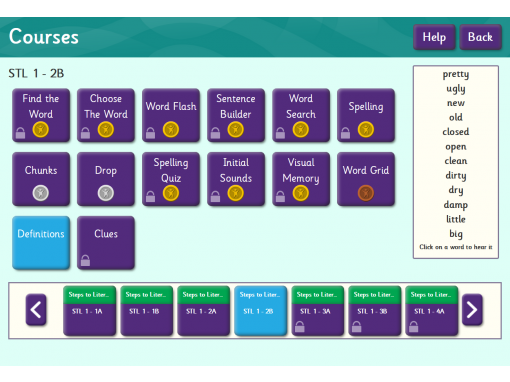 A range of leading educational software programmes covering reading/spelling, comprehension and memory. Already recognised as one of the leading literacy programmes in the world. Structured, multi-sensory and highly effective. Caters for all your learners. Find out more about one of the leading literacy software programmes in the world. Customizable for every learner. Support your child’s learning by choosing effective, enjoyable, research-based resources. Full educational advice and support available. Welcome to The Learning Staircase! We design and retail top quality educational resources and software for learners of all ages, including adults. Our products are now used in over 700 NZ & Australian schools and by thousands of parents and specialist tutors (see our great testimonials). Click here for a Free Trial of StepsWeb.